I like this soup because it comes together quickly for an easy weeknight dinner and reheats well the second day. This is not traditional Vietnamese pho, as it is essentially a hybrid between Vietnamese pho and Thai green curry. The green curry paste adds a savory element with a hint of spice while the coconut curry adds sweet creamy flavor. 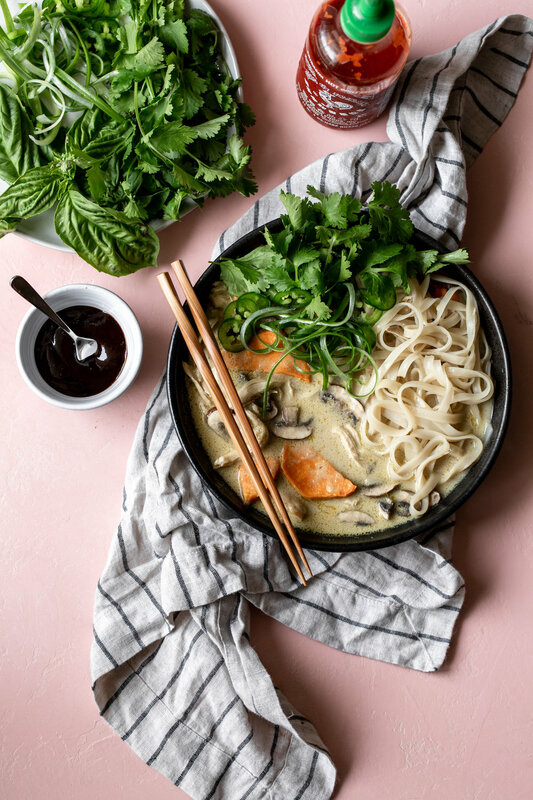 I love the rich creamy coconut-based broth with the rice noodles and sweet potatoes added for a flavorful, filling dinner. Serve this dish with both soup spoons and chopsticks so that you can pick up the long rice noodles and slurp the broth. For a shortcut on a busy night, substitute the chicken breasts for shredded rotisserie chicken. Heat a large Dutch oven or large heavy-bottomed pot over medium heat. Add 2 tablespoons of the olive oil and heat through. Add the chicken and brown on all sides, about 4 to 5 minutes total. Remove the chicken from the pot and set aside. Add the onion to the pot and sauté, stirring occasionally, until the onion is soft and tender, about 5 to 6 minutes. Add the garlic and ginger, stirring, until fragrant, about 20 seconds. Stir in the green curry paste, and let cook until fragrant, about an additional 30 seconds. Add the coconut milk and chicken, stirring to combine, and bring the mixture to a simmer then reduce the heat to low and let cook for 5 minutes. Stir in the chicken broth then bring to a boil and cover the pot or Dutch oven and simmer over medium-low heat until the chicken is cooked through and tender, about 30 minutes. Heat oven to 400ºF. Toss the slices of sweet potato in the remaining olive then arrange in a single layer on an aluminum foil-lined baking sheet. Bake until the sweet potatoes are tender and the edges begin to brown, about 20 minutes. Bring a medium pot of water over medium-high heat to a boil. Cook the rice noodles, stirring occasionally, until tender but not mushy, about 6 minutes. Drain in a colander under cold water, then divide the noodles among the serving bowls. Remove the chicken from the pot and shred using two forks and return the chicken to the pot. Stir in the fish sauce and mushrooms to the curry mixture. Return the mixture to a simmer and let cook for about 10 minutes. Add the sweet potato slices then remove from the heat. Arrange the green onion, cilantro, basil, and jalapeños peppers on a small plate and serve on the side so toppings can be added as desired. Ladle the soup into bowls over the rice noodles, and add desired toppings. Serve with hoisin sauce and sriracha on the side. *Note: Green curry, fish sauce and rice noodles can be found in the international section of your local grocery store, at an Asian market or online (Amazon has everything).